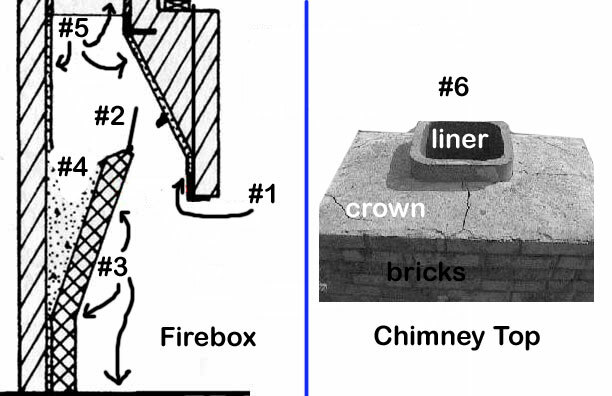 How to inspect a masonry chimney and firebox prior to installing an insert - submitted by Elk (a building official) edited by Gooserider. Note: The following is written with a wood burning insert or stove in mind. Standards and procedures differ for gas and pellet appliances. Before an insert is installed, it must be verified that the fireplace is structurally sound and safe. A wood burning insert generates a considerable amount of heat, which must be contained by the fireplace structure to keep it from reaching any combustible parts of the house. AN INSERT IS NOT THE CURE FOR AN UNSAFE FIREPLACE! If the fireplace would not be safe to build an open fire in, it is probably not safe to put an insert into without some updating and modification - specifically, a properly installed chimney liner and basic masonry repairs and sealing. Note that this process is intended for masonry fireplaces with clay tile flues, if you have a Zero Clearance (ZC) or other metal fireplace, and / or a chimney made with something other than clay tile liners, please see [[Convert Prefab Fireplace or ask for advice in our forums. A building permit is usually required when installing an insert. Check with your local inspector and jurisdiction before your purchase. Some inspectors will require a condition report on all chimneys more than 10 years old prior to issuing a permit. This report can easily be done by a local chimney sweep, who can also perform the inspection below. A licensed masonry contractor would also be qualified. The inspector may allow you to do the inspection and report if you can convince him that it was or will be properly and competently performed. Taking lots of pictures, before, during, and after is helpful. The inspector may be willing to do a preliminary inspection to see what questions he will need answered. Good flashlight, trouble light, or other strong light source. Shop vacuum - This can be a very messy job, it helps to keep cleaning up the crud as you work. 1. The first check is mostly needed on fireplaces with a brick facing that only goes part way up the front wall, with a combustible wall and/or mantel above. It is less likely to be a problem in full-faced floor to ceiling masonry faced fireplaces, but should be checked regardless. Unfortunately, all to often, the brick or facing is not sealed properly to the firebox structure. With your flash light, from inside the firebox, shine towards the front. Many times you will see a metal angle iron called a lintel, that supports the front edge of the fireplace opening. Look for a space between the front brick or masonry facing and the angle iron. There should NOT be any gaps! If there are, then chances are it is a direct path to the combustible header and framing material above. The easiest way to fill a gap is to apply refractory cement with a caulking gun, forcing as much cement into the space as possible. If you see framing wood very close to the lintel, have it checked carefully by a pro. 2. Remove the Damper plate. They are usually held in with cotter pins. Removing the Damper plate makes the inspection and repair easier, and most insert installations will require that the plate be removed. 3. Examine the existing firebricks in the entire firebox looking for cracks in either the bricks themselves or in the mortar joints between them. Any cracks must be repaired before the insert is installed. Repair by removing loose mortar and any soot or dirt, dampening with a wet sponge and using your caulk gun with refractory cement. It helps to "V-groove" out the crack to give the cement more surface to bond with. Note: if you have metal interior firebox walls, but a masonry chimney, you may have a [[Heatform - in this case, you can skip #3 and #4, but do check the integrity of the metal as these can rust! 4. Lightly tap the firebricks on the walls starting at the bottom and working to the top. Do this on both the back and each side. If filled with the required solid masonry the tapping sound should be solid and consistent. If you hear a hollow sound, especially as you work towards the top, you just discovered the prior mason may have taken a short cut and not properly filled the Smoke Shelf area behind the Damper. There may be leaves and all sorts of other combustibles in there, possibly even construction debris, including blocks of wood. Elk reccomends a "dental style" inspection mirror, or even an angled hand mirror and a bright light to look into this area and make sure it's clean. Fish your shop vac in there and clean it out. The area then needs to be filled with non combustibles. It is almost impossible to get mortar into the space, but filling it with sand is acceptable. A possibly better option would be to use a dry masonry mix, such as "Sakrete," to fill the space, then add some water so that it will harden over time. 5. With the Damper plate open or removed, it is time to inspect the chimney. Shine the light up your chimney, look for creosote (which will need to be cleaned off). Look at your clay liners. Do they line up? Do you see missing mortar in the joints? Do you see any cracks or missing or flaking clay liners? If there is missing mortar in the joints, or signs of damage to the clay flue liners, a full stainless steel liner is required unless the clay liners can be reached for repairs. If you dont have clay liners, ask for additional advice on the forums; you will probably need a full stainless steel liner. Also note the size of the flue liner (measure during #6 when you are on top of the chimney). This will help determine whether you need to fully line the chimney to satisfy the building code. Current Cross-sectional codes dictate the size of flue liner allowed. The most common size insert and stove flue collar is 6". In an exterior chimney, you can use a liner no more than twice the flue collar diameter, so an 8"x 8" clay liner is OK, but an 8"x 12" liner is to large. In an interior chimney, you may use up to three times the area, so the 8"x 12" liner would be OK, but a 12"x 12" would be to large. Elk notes that even though code compliant draft wise, he recommends full liners in flues larger than 8"x 8" for 6√¢‚Ç¨¬ù stove collars, as this gives a much better working installation. 6. The inside firebox inspection is done. Time now to head up to the top of the chimney to examine the chimney crown cap and look at your flue liner from the top down. First, look at the bricks. Are they intact? Is mortar missing in the joints? Are the top layers cracked or loose? Is the crown cap solid with no cracks present? Finally examine clay liners, as in step 5. Do you see creosote? Missing mortar in the joints or cracks? Missing or flaking tiles? Repairs and/or cleaning may be needed, and unless you are a very handy DIY'er, this might better be left to a chimney sweep. Woebegone and Sticks&Stones like this.